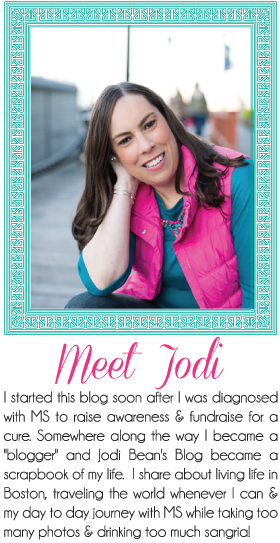 Jodi Bean's Blog: My Shoes. . . I will forever walk in the shoes of a woman who has MS. I changed the last line of this poem to "who has MS." It was written for another use but rings so true for people living with MS. As a social worker and as a person I try not to be judgmental or to make assumptions about people. I often say to myself and/or co-workers "until I've walked a day in her shoes I'm not going to judge/assume." I think it is a good motto to live by. I don't know what it is like to live someone else's life. Life is different for everyone. Everyone's journey is different. I walk in my shoes on my journey which has been shaped by MS. I can honestly say that it has greatly impacted everything I do and every decision I now make. But my journey is not a sad journey or an angry journey or even a depressing journey. Yes there are bad days and my future health is unknown. But there are also a lot of good days, great days, happy days, time with family, vacations, time with friends, dinners out, sunny days, good books, funny reality tv shows, laughs, drinks, memories, support, love and HOPE. My journey is filled with hope. Hope that one day I won't walk my journey in shoes with MS. I hope that one day there will be a cure. I hope that I will continue to be strong and happy and motivated. I hope I will never give up the fight against MS. I think this blog is a wonderful way to raise awareness and deal with your trial, and choose to be happy! You are so inspiring. I found you on Design it Chic and am following now. Your blog is lovely!